Alright we're talking about this. I have a kind of brownish hair color naturally. It's darkened quite a bit since I was a girl, but I've always had a lot of red and gold strands woven in. I see my daughter's hair color in the sunshine, and know exactly where she got it from. I love that I have passed down my eye color, skin color, freckles and hair coloring to my girl, because for the most part, I love those things about myself. 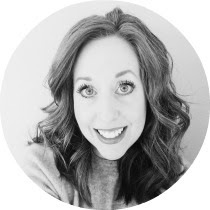 I have already mentioned in previous postings, that before I had children, my hair was slightly wavy but after kids, it's full-on curly. Wild, and lion's mane-ish but when done right, I kind of like it. I don't remember the exact age I was, when I first spied a gray hair. I do know that after I became a Mama at the ripe age of 26, I began getting a few more. By the time Ava was born, I was a 28 year-old hair coloring woman. Mostly foils of blonde with the occasional bouts of attempting my natural color for long stretches, becoming a brunette once again. Which incidentally, I loved. I also love having blonde hair too. The truth is, I want to be my most authentic self in all aspects and (for me) there is something about letting my skin be it's porcelain pale shade even in the summer because I simply do not tan naturally, and never have.. not even once. (I skipped faux tanners altogether this past summer, and somehow I lived with my pale skin.) There is something about letting my hair have it's way with this crazy natural curl. I'm getting loads of great product advice and even books on how to manage curly hair. Do you know, in the last two decades of my life, I have not ever intentionally let my hair air dry? I didn't even know it was this curly until a two weeks ago. The first day I let it be curly, I was standing in a grocery store, and a woman behind me asked if my hair was naturally curly. I know that I blushed with self-consciousness because I hadn't been "out" with the wild hair before. She told me that it was gorgeous and made her wish she had naturally curly hair too. I tried to control the beaming smile in my heart and on my face. It made my day people, not gonna lie. And finally, this authenticity party has led me to a desire to let it be the color that it IS. I can't explain it. I used to watch interviews with woman in their later years talking about how they were finally comfortable in their own skin. They would wax on about accepting themselves the way they were, and how they had been created, and a corner of my heart would always perk up and think, "I want that!" I keep thinking that perhaps if I'm not working so hard to change the outward things... maybe the inward things will get the focus they need and I can become that softer, sweeter, older version of me that I have longed to become this past decade. Does that sound crazy? I mean, you have to get to that comfortable place with yourself somehow. I don't think it magically just happens, right? Now. For the practical part. Growing out your gray. There are at least 100 reasons to go gray, as stated here. That's what everyone wants to talk about. It's going to be painful but here is my theory and take it for what it's worth. I have a ton of gray for a woman my age. I imagine it's only going to multiply and the longer I put this off, the harder it's going to be. There, I said it. I estimated that I spend approx $600+ a year on hair coloring appointments. That fact was the nail in the coffin, so to speak. My sweet man who holds the budget strings raised an eyebrow, and when he does that, I know it's shut-down-time. There are entire (really cool) websites and facebook pages dedicated to growing out gray hair. There are cute pixie cut options (which will be a last resort for me if the plan my hair dresser and I have doesn't work out). 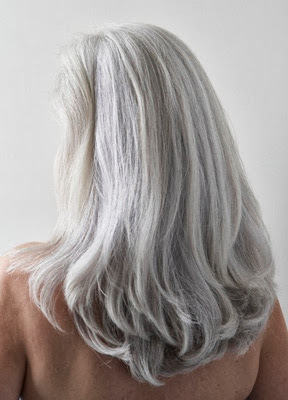 There are encouraging stories like this one that pretty much had me cheering for those with gray hair grow-outs, and finally, gorgeous shots of women with shiny, silvery hair. I don't think that I have quite this much gray but I've got enough to notice and I maybe shocked by the amount once this process begins. There are tons of products made to help in the process. There are mascara wand-type products, there are between time touch-up sticks, there are tinted hair powders, rinses and temporary coloring mousses. There are also cute hats and headbands to camouflage, and well... you get the idea. How about you- do you have gray? Do you color? 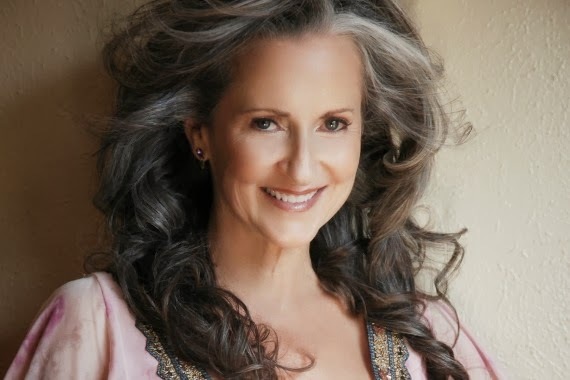 Would you consider going authentically gray at whatever age you are right now? Are you authentically gray now? If so, how do you like it? Weigh in with your thoughts girls, I'd love to hear what you have to say and read how we can encourage one another! Love this. So nice to feel like you can be your authentic self and still be loved and accepted. Hi Saha! I am about to turn 48, and I have been blessed with my mom's genes! I have one gray hair that keeps popping up at the crown of my head. I have similar hair color naturally to your daughter, and I have highlighted since late teens. I really am unsure of if I will let it just come in, or if I will highlight over it when the time comes. i love those images, but that one gray that keeps popping in is coarse and wiry, so I am a bit afraid! I know you Sasha, you will embrace any hair color, even gray, with an niner glow and confidence. Can't wait to see! I just turned 60 a month ago and I decided over the summer to let my naturally salt and pepper hair grow out. For me it was a decision based in economics and just being tired of all the time the covering of the gray takes. I have so many more wonderful ways to spend my time and money. At the moment I have ends of highlighted blond and the new half of gray and my natural dark brown. I wear my hair short so another hair cut or two and the grow out process will be done. At that point I am gong to see if I like it. My oldest son is getting married in April so it's tempting to color it but I think this is about just getting comfortable with who I am, gray hair and all. Keep us posted on you thoughts and progress. My new mantra is "beauty is on the inside"!!! Im 47, I let my grey grow out about a year ago......I love it!!! I just got tired of the upkeep, my hair is pretty short so it didn't take very long to grow completely out and like I said I love it. Go for it......you won't be sorry! I needed this encouragement. Thank you!! I like to call it silver, and I let mine grow out 4 years ago for health reasons. I wish I had curly hair like the lady in the 4th photo, she looks awesome. I kept it short while growing it out and then just kept it short because that in between stage is hard to manage. When I look in the mirror I sometimes wish I was still a brunette,and I also wish I was still in my early thirties. Like you said you have to get comfortable with your own skin and hair and aging gracefully, just accepting your stage in life and how God made you. I love not having to color my hair and stain my bathroom and know that I am not piling chemicals on my head that seep into my body. You are so pretty that you will look radiant. I also found I could wear completely different colors that I had not worn before. There are lots of good things about going natural! Can't wait to see the new you! I am 56. I guess you could say I was lucky as I don't recall a gray hair until 50. Might have been there; I didn't see them. I have asthma and I cannot take the strong smell of hair colorants. I have had my hair highlighted I think twice in my life. Never colored. And I never will. I wear short hair now because it suits my lifestyle better. But listen up, you younger gals, you earned that gray hair. Gray hair speaks of living and learning and gaining wisdom. Don't try to hide your gray. Embrace it. I see far too many women trying to "keep that young look." My ex use to tell me he thought I actually enjoyed getting older (sarcastically), and I said no, but it's better than the alternative. I didn't mean to make this a novel. But once you let go of that "getting old" fear, you focus inward. And I can say that I am now at peace, living very frugally in a little bitty house with my two dogs. I just turned 47 a couple of months ago. Had my first gray hair at 27. It didn't start getting salt and pepper until about 13. I started coloring it about eight years ago. Mine is wild. Those gray hairs are all wirey. More coarse. I have debated over this last year to give in and let it go gray. It is expensive. I have to do it more often cause the gray comes in faster. Ugh. I think you will look fabulous. I too believe beauty is on the inside. I will fight it as long as I can. To save money by only cutting it every other time. I will do bang trims and touch ups several times then get a glaze. I try to only do all over color about every nine months. I have very dark hair and those gray hairs really show. I look like skunk if I do not keep it going. I always wear my hair down until the gray starts showing. I stretch it one more week by wearing my hair up a lot the last week or two. But when it is time to go gray, I plan to color it all gray all at once. They let it grow out however it wants. That is what my grandma did (she colored her hair black unitl age 70). Good Luck! I am sure whatever you do, it will look great! I had blonde hair when I was young and started the whole highlights thing as a teen because mine turned mousy. When I was in my 50s let it grow to natural and everyone wanted it blonde again. So I gave in to the pressure but did stop the costly trips to the salon for color and did it with a spray from John Freida that really did work pretty good and only had to do it about every 3 months or so. But I am 62 now and do have a little more silver and have stopped coloring again. 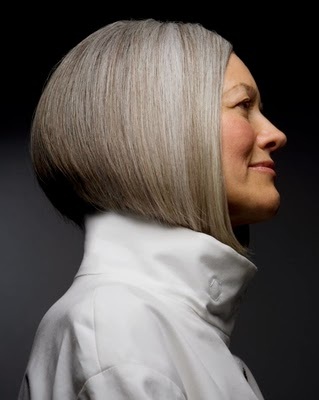 I will never have that beautiful full gray or white hair that I so love, but am going to embrace what I do have. I do have to say that I do not like to see really gray hair that is died and then starts to fade and the roots are gray and the rest starts to turn a different shade each week till colored again. I guess we have to do what feels right to us. That is the beauty of becomming vintage in that we come to be happy with what we have. Bravo for wisdom! I am a 37 year old light brunette and I've been getting blond highlights to camoflauge my gray for years. I have a ton of gray hair. Recently I've started feeling like I should stop fighting my aging process, no matter how premature I think it is. Plus, I could spend those hundreds of dollars elsewhere for sure. I think after reading this I'm going to go gracefully into the gray with you. I'll need lots of encouragement and affirmation! Hopefully we can do that for each other! No grey here yet...I'm 30. My hair is naturally very light ashy-golden brown (I call it caramel), so it could be that any greys just blend in. My dark-brown-haired husband, on the other hand is starting to get a few greys and I love it. Are the pictures in this post of your friends? Either way, they're gorgeous! I'm 52 and am about 5 months into letting my "color" grow out for the second time! When I did it a couple of years ago, I ended up cutting it short to cut off the color. Then for some "dumb" reason started coloring it again. And wish I hadn't! I have shoulder length hair right now but am considering getting it cut short again. I don't feel the need for people to think I'm 10 years younger and to be honest... I'm not fooling anyone anyway! Fighting roots is not a battle I want to continue spending time and money on! I admire women who embrace their natural hair color! And silver/gray is beautiful! It'll look great on you. With the exception of highlights when I was in my early 20's, I've never colored my hair. Don't know many women who can say that. I have gray and I earned every single dang one of 'em. No color for me. I'm not fru-fru, never have been and it is what it is. I can't see spending time and money making myself something I'm not meant to be. No disrespect intended to anyone out there who colors, paints toes, pierces, whatever. Go for it Sasha! Your man will love you all the more! I'm 42 with A LOT of grey hair. I get my hair colored, high and low lighted every 4-5 weeks. For me, I will continue to color and fight this grey hair thing for a loooooong time to come! I want to look as young as I can for as long as I can. I feel so much prettier and so much more ME when my hair is colored. Now, with that said, maybe in my 50's I will feel different. I started noticing gray hairs about 3 or 4 years ago....I didn't have to start coloring it until about 2 years ago. So far, it seems that I can get it colored about every 6 weeks. I've worn it longer so that I didn't feel the need to cut every time I color it. For now, that works great. I'm really not sure what I'll do as the years pass by....I'm sure I'll go gray, eventually. I had my first grey hair in grade nine...so what are we talking...14 or so. Kids would walk down the aisle in a class and comment on it as they passed by. I am now 55 and have been dying my hair since my 20's. Last February I decided the time was right to grow it out. Sadly it turned out to be pretty much white instead of grey....so I dyed it again. I looked like Mrs. Claus I hate having my hair dyed. The hairdresser has to use the high test developer just to get it to cover and it only lasts a few weeks before you can see the white at the temples and around the face. There can't be anything good about letting those chemicals sit on your scalp that long or that often. Not sure what I'll do next. What a wonderful post! I started seeing grey at age 28 or so and now that I'm 30 I see more and more. Sometimes it bothers me but after reading this I think I need to try to embrace the greys more. About 6 years ago I let my blonde highlights grow out and actually LOVE my dark brown hair so much more. I got tired of fighting grown out roots and decided to enjoy my natural hair color as long as possible. I've never liked the thought of what I would have to spend to have it dyed and sitting in a salon for hours on end each time. I might just have to embrace what is to come and see what I think. I'm sure following along with your grow-out process will be encouraging. Now- about that curly hair! I have crazy curly hair and curls with a mind of their own. Some days my hair is curlier than others and it all depends on the weather. I used expensive salon products for a couple of years and loved the results but hated forking over so much money each time I ran out of something. I just started using Herbal Essence Totally Twisted products and am really liking the results I get for a fraction of the price. It makes me feel good knowing that I'm saving our family so much money with this easy change. Best of luck and keep us posted how it is going! mine is curly curly curly too Sasha...and yes I have gray...and blonde...and gray...soooooo...that said, I'll keep the blonde for awhile longer...the older I get the more curl I get...Carrie's is curly too, but she keeps it wavy. No matter what you do you'll be gorgeous..from the inside out! Oh, my, I've been coloring my auburn colored hair for almost 25 years (I'm 61). If my hair were gray, I think I would grow it out, but auburn hair doesn't really gray, it is a yellowish color that isn't very attractive. So, guess I'll stick with the coloring a while longer. But, I bet you will look good and I applaud your reasoning. Happy weekend! Your hair looks so pretty! I've been gray since I was 23...I'm now 53 and have colored my hair all those years. I got highlights for the first time ever this week so the gray will come in easily. I've also decided to let my hair grew longer to save money. Now my 28 yr old daughter said she thinks I look younger with longer hair haha! You will be pretty no matter what color your hair is. I'm 40 and my hair has been all over gray for the past 8 years. My hair feels better and looks better than when I was coloring it. I tried both professional and at home coloring but couldn't stand it anymore and went gray. Give it a try.....as long as you have a nice cut, I think you will be surprised at how much you like gray hair! Enjoy! Sasha, I went through the growing out the grey about five years ago. Like you I cringed at how much I was spending assisting my hairdresser to take fabulous overseas trips. I would be happy with my hair for about two weeks and then the grey train track would appear down the middle and I felt terrible until the next expensive hair appointment. I was not prepared to do the pixie cut as I've always had long hair, so I persevered against some comments from work mates like, "Are you sure you're doing the right thing?" And I am sooo happy now. It's much easier to manage my hair and I get lots of comments about the colour. "Is it natural?" "Love what you've done to your hair!" Once you've grown it out you'll never turn back or regret what you have done. Please don't cut your hair to make it easier to go to your natural color. You'll find a pace that works for you. I did a few highlights; 6 months later highlight again, but not as many, and one more time with just a very few (7 - 10 foils?). That really helped the grow-out process look less drastic. (I wear my hair shoulder length or a bit longer.) Anyway, I think age is way more about attitude then it is about gray hair :) You'll be beautiful no matter how you approach it. I have just recently had the grey hair grow-out discussion with my husband. I've decided I'm just not ready yet. I'm afraid of how much it will age me. You and I are the same age, so maybe yours will inspire me! I started going grey when I was in high school, and have been coloring since then. At first I was just experimenting with colors, and then it became a necessity to get rid of the skunk stripe. If mine grew out, it would look like the third picture, only curly. I wish there was a way to just get to that point without the daunting task of growing it out for months and months. Good luck with your hair journey! I've never been a hair color girl. I am blessed with the color of hair that people pay good money to try to replicate (at least that's what my hairstylists have always said). It's medium blonde with many other shades (brown to light blonde) thrown in here and there. I have noticeable (to me) grays here and there now - not sure when they started coming in. I would rather spend my time and money doing things other than sit in my stylist's chair so I will just let the gray continue to come in naturally. I've colored my hair off and on since I was 16, but 2.5 years ago I started putting Henna in my hair instead. I was naturally dark blonde that was getting darker, but had been putting horrible chemicals on my hair to make it light blonde and cover the gray. My hair was fried and dry and brittle no matter what I did to correct it. Henna binds to the keratin in your hair and "permanently" colors it. You can lift the color (chemically) to get a lighter shade but you can't really remove it without melting your hair. The benefits of using Henna far outweigh the permanent color to me. My hair is healthy, shinny, and thicker now with no brittle, dry ends breaking off. Right now I'm having too much fun as a red head, but someday I just might consider going gray! I am just into my thirties and lovely white/silver strands are running through my very dark/black hair. Luckily not really along the face line yet, but I am on the fence, to dye or not to dye? I know it will be a never ending battle with dark hair and I just don't have the time to be in a beauty salon every 4 weeks. I love this post!!! I am a 48 year old pixie cut wearing mother of two and professional. I LOVE my pixie cut and won't wear it any other way ever again. I do color my hair to cover the gray, but it is the natural shade I was born with. I don't color monthly - too expensive! well..yes i have grey. have since i was in my 20's. my dad was prematurely grey and i look like my fathers side. a lot. big nose..big legs hairy...well true! In principle I want to go grey too ... But ... I'm 44 and never dyed my hair until a few years ago. I have a great hairdresser who doesn't charge much at all, and I only go about three times a year, and I use cheap old shampoo and conditioner in between. He does streaks and a colour bath (not straight dye). And the confidence that those blonde streaks has given me is just enormous! So I'm going to keep going for a couple more years, but am dragging out the time between hairdresser visits, keeping it real. Sasha you will always be an attractive woman with a healthy glow, and you will look lovely as you start to grey. My comment to any and all who ask me if I am every going to color the gray streak in my hair is, " You can have my gray hair when you can pry it from my cold, dead fingers." I'm going to try it! My mom was "silver" by the time she was 40 and ivory beautiful skin. Mine was blonde (white) growing up. Then as I hit my 20's it turned darker blonde with reds and glolds. My daddy had auburn and grandparents flat out red. I also always had wavy and "lots" of hair well now at 50 it's a head full of crazy curls. I love it. I just turned 46 in September. I have been going grey for a little over a year, but the past 6-8 months it is has really taken off. I like simple, but do like to look edgy and funky/groovy. Cost was a major factor because like you I colored and did highlights. I was sick of being a slave to my hair!! I finally said enough is enough. My hair dresser, which is much younger, thought I was nuts, but said she would do whatever I wanted. My hair is past my shoulders so I started getting it trimmed with a tons of layers. This cut out a lot of the brassy grown out color/highlights. Later I went back in for low-lights to match natural color. And am about to get another trim. I LOVE the natural color with SILVER shining through. And talk about funky hair! Like I say on my blog and Instagram I WILL ROCK the grey hair. It is what the Good Lord gave me and I can make it work. I am 42 (nearly 43) and I have to colour my hair every 4-6 weeks to hide the grey part I have. I am tempted to get all the colour stripped out to see how grey I am rather than just the regrowth I see all the time. Part of me wants to go au natural and the other part of me says I am to young to grey. I will be following your progress with interest. Hi, I found you via Paige Knudsen's blog!! I just wrote a post on my blog about growing my hair out!! Yes, I too am rocking my Platinum strands courtesy of my beautiful grandmother, her mother and sisters' genes!! I feel empowered and almost cutting edge because I am doing it my way and not what the "norm" dictates. Go girl!! Let's rock our Silver strands!! I also found you through Paige Knudsen's blog. I'm a stalker there too, but after reading your "going gray" post, I had to comment. I am 36 and over the past two or three years have realized that keeping my gray covered has become almost chore-like for me. I have naturally dark hair and I have run the gamut of highlights, low lights, 3-4 coloring appointments for an all-over "natural" color and it is flat out exhausting. Earlier this year my stylist moved out of state and I was left in a real bind. I began to think about the cost and inconvenience of monthly hair appointments. And the epiphany that I had was this, "I am not fooling anyone!" Sometimes even as soon as two weeks post color, I have root growth showing my gray. My stylist moving has motivated me, like you, to just let it be. I am so sick of coloring my hair. I am who I am. I have gray hair. So what. I've even seen a meme online that says they are just "wisdom highlights." In my three month journey so far I have discovered this. (1.) It isn't even as gray as I first though it might be. (2.) I truly feel more free to be me! (3.) I am glad to be chemical free with my hair. (4.) Having multiple dimensional color makes me feel so much more real than this all-over helmet of brown I had for so long. (5.) Like you, probably the first time someone other than my family makes a comment about my age or hair or both it will hurt my feelings and I give myself full permission to color it again should I so choose. Lastly, I know that growing out gray is a process. I, too, have read multiple articles and websites and tried to figure out all of the tricks to make it painless. For now, I'm not chopping it all off into a pixie, but I am planning over the next several months to get regular, good haircuts with some layering. My "prize" if I make it until March is to get a new spring makeover and all new makeup to accentuate my new look. I guess I'm just not as brave as you young-ones! I am 77 years old and do my 1/4" roots every 4 weeks for $1.50!!! A beautician told me a secret 13 years ago...use 1/2 of each bottle of the color, mixed in an extra bottle. For a reason I can't explain, the blond highlights have stayed light and I use medium brown on the roots. I can't imagine my hair any other color...this is ME! I can 'forget' about my hair and enjoy my 3 children, 9 grandkids and 11 greats! One hour a month and $1.50...not bad! I wish you well and will be checking back to watch your progress. Your love for our Lord makes you beautiful! lighted and I've been my natural color. No greys for me until about a year ago. blonde highlights to help mask the grey. in her 40's. Very inspiring! I am 39 y/o female and have long wavy brown hair with white hair here and there, but I want more white hair faster!! I LOVE it!! I stopped coloring my hair --- period --- at age 36 and won't look back. Natural is softer, shinier, healthier, prettier by far. White hair is GORGEOUS!!! !